In Arch Supremacy you may journey down the path of developing an Empire utilizing Minecolonies. The running theme of creating an actual Empire is not something you find often. You will find quests in the pack that teach you and guide you. 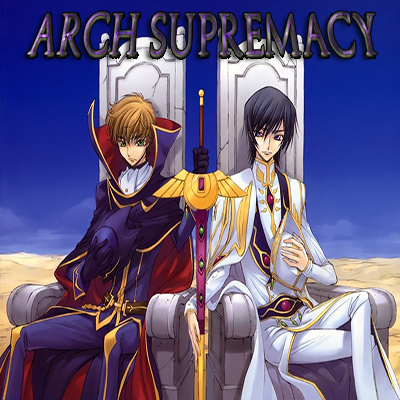 Arch Supremacy contains a variety of Magic Mods and some of their addons. For those who prefer technology, you will also have access to a wide selection as well. Perhaps you wish to wage war against the Magic users and you only foucs on Technology. Perhaps you are the Magic users and want to rid the World of Technology. Or perhaps you are a middle party and want to utilize the best of both worlds. Or maybe you are one of the few that wish to create an Empire in space and invade from the Cosmos? Perhaps, you wish to Establish your empire in the Between Lands, a dark and mysterious realm where strange, monstrous creatures roam amongst the remnants of long lost civilizations, and you are the individual that wishes to rebuild civilization in that realm. This pack is unique in a sense that no matter what you decide to do, you will always be able to do something, even if it simply to play with mods and completly forego the Empire Building. There is no "set-path." Play solo, or play with friends or play with a community. The choice is yours. Whatever, you decide the pack allows for. There is not an advantage of picking Magic or picking Technology. All parties can defend themselves and their Empire. For those who prefer Hybrid of both you will find this just as suiting. The Modpack is designed with Multiplayer in mind and is completly Server friendly. There are a few client-side only mods that you will have to remove and configs you will have to change, but perhaps in the future I will create a "server-files" download. So pick your path, build your empire (or conquer another's) and enforce Arch Supremacy over your world. Just a note. This pack has a lot of mods in it, however in my humble and personal opinion I do-not consider it to be a "heavy" pack. Majority of the mods in this pack are small utility mods in here and dependecy libraries that really bulk up the size of Active Mods. That is not to say there are some massive mods in here but I can't consider it a "heavy" pack. Others may have differing opinions and that is fine. Regarding OptiFine - I use it on my version of the pack along with some Shaders and really don't have any issues. However, I have obviously not come across EVERY single combination of EVERY SINGLE mod etc. etc. It is possible OptiFine may cause some issues with mods in this pack but from my expereince it has been okay. I would always recommend removing OptiFine first if you run into an issue and if it persists then report it. 1.0.6a Update has resolved the dependency issue (as it was actually a TwitchApp error which has been fixed by the TwitchApp team) and AcademyCraft has been updated along with a few other mods and the LambdaLib. The 1.0.6a update also updates the Forge version to satisfy the requirements of the JEI update. Thank you, lol I figured it fits the theme of the pack. More quests (although plenty can be done without quests) will be coming in soon now that I have resolved the ridiculous dependecy error. 1.0.5a fixes the dependency issue. All the other Mod Updates from version 1.0.3 to 1.0.5 are mirrored minus the AcademyCraft update. Thank you brym_ for discovering it. In a few days to avoid confusion I will likely be Archiving version 1.0.3 to 1.0.5 so they do not appear in the TwitchApp. Holy crap - wow. Academy Craft wasn't even in my mind since it didn't even have remotely the same ID number. I wonder if it is a Twitch Issue or a File issue. Alright awesome. Thanks a lot for the report. I will be uploading the "non-academy" craft version later today. Or maybe I will try the non-updated Academy Craft version? We shall see. Once again I really appreciate it! No problem, in a way you helped me figure it out, I compared our modlist and that was the odd one out since I've recently added mods to it and it stopped working after I added those mods. Hey, my modpack is having this SAME issue, the same number as well! "Cannot find addon dependency 316472" Please let me know if you figure out what's wrong! I'm going to start removing mods to see if it fixes it. I haven't been ignoring the issue. I opened a CurseForge ticket and they said to open a TwitchApp ticket so now I am waiting on the TwitchApp ticket. Same error with the 1.0.4a varient. Says it cannot find 316472. Now that is generally a project ID. The problem is that none of the IDs in the pack have that number. If anyone has any ideas please feel free to post. I will have to submite a ticket to support it seems. Got it, if i had to guess it is one of the FTB Mods. I noticed on Curse it had an API error which I beleive has been corrected but there is a chance that my pack was updated before the error was fixed. I am going to attempt a re-up in a few minutes so a "new" version of the modpack should resolve the issue. EDIT: The 1.0.4a Varient just went live. Hopefully that fixed it. neither A nor B is working. This seems to be a Twitch App issue. As per m support ticket here on CurseForge they said "Nope gotta go to TwitchApp" - So for now utilize the "Welcome to the Academy Update" - All that has changed in the pack is mod updates - no new mods were added. In the meanwhile I am going to have to try and test this one mod at a time which also means uploading multiple version one at a time. However, I will keep them in an "alpha" status to flag them until I can figure out which ProjectID is doing this. Because 316472 is something called catserve Overview or something like that which is no longer on Curse and is not even present in the patch AND if you look at the actual manifest file 316472 isnt even present on the list. So it must be a TwitchApp thing. 1.0.1 released to roll out the first round of quests. More will follow. Nothing as of yet shows up in quest book. do you have a time line for when your quest book will be implemented? Yes. Quests will be in the 1.0.1 release that I have scheduled for this weekend. This release was mainly for platform managment so it can sync across Curse and just the intital "creation" of the pack for purposes of the Curse Project. It is possible that I will get the 1.0.1 release out sooner with at least some base line quests but it is scheduled for Saturday or Sunday. Also worth noting. Quests will be an ongoing thing. More quests will come out over the life of the pack. The pack is rather large. So rather than delay updates of the pack or mods in the pack pending quests, the quests will be rolled out with different pack updates. This system of managment also allows for large pack updates that specifically may introduce entire new quest lines. This will allow the pack to update independently of the quests adding in new mods etc. Or allow the pack to update and have the update only contain quests etc. The reason I have selected BetterQuesting in this pack is because your progress is saved independently of the quests. So if you complete a whole branch of quests, they should stay completed even when a pack update is released that adds more quests into the pack. I love questing packs, so will keep eyeout and give it a try.